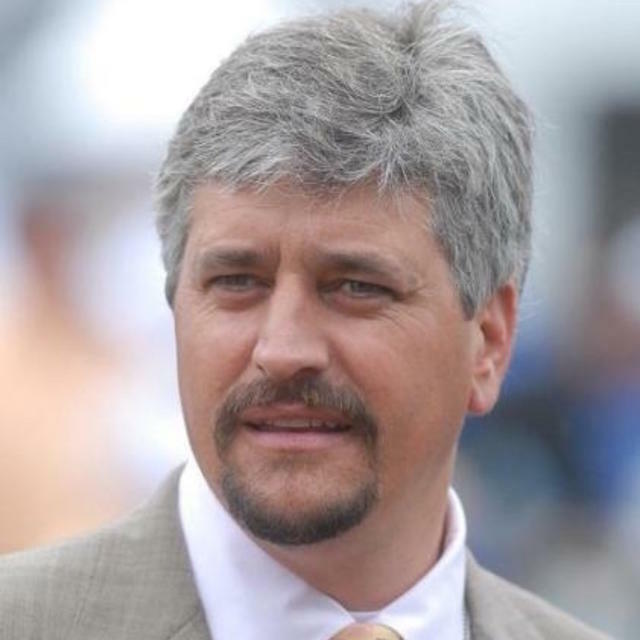 Four-time Bashford Manor-winning trainer Steve Asmussen relishes the opportunity to try Jerry Durant’s maiden Show Bound on dirt in Saturday night’s 114th renewal of the six-furlong sprint for juveniles. Show Bound, a Kentucky-bred son of Warrior’s Reward out of the Hennessy mare Spanish Cat, weakened to third in his career debut on June 7 at Belmont Park, a five-furlong sprint on grass. Sent to post as the $1.55-1 favorite in a field of seven, Show Bound was hooked in a speed duel from the inside with eventual winner and Bashford Manor rival Shoot Craps, who shook free with an eighth of a mile to run. Show Bound finished 2 ½ lengths back in third. So does Asmussen, a 14-time leading trainer at Churchill Downs, expect Show Bound to move forward on Saturday? On Saturday night, Shoot Craps will break from post five as the 2-1 second choice on the morning line with Show Bound on the outside in the field of eight 2-year-olds as the 5-2 third choice. Churchill Downs maiden winner He’s Comin in Hot is the 9-5 favorite and breaks from the rail. A Bashford Manor win by Asmussen on Saturday would equal Hall of Fame trainer D. Wayne Lukas’ record for the race. Asmussen won previous runnings of the storied race with Lunarpal (2004), Kodiak Kowboy (2007), Kantharos (2010) and Cinco Charlie (2014). SKY FLIGHT GETS NEEDED RACE IN FIRECRACKER – John C. Oxley’s Sky Flight is one of the more intriguing entrants in Saturday’s 26th running of the $200,000 Firecracker (Grade II) at one mile on the Matt Winn Turf Course. The lightly-raced 4-year-old will break from post 2 and is the 7-2 third choice on Mike Battaglia’s morning line. Not at original nominee, Sky Flight was supplemented to the race for $6,000. The Firecracker will be Sky Flight’s first race in 154 days. He hasn’t raced since a third-place finish behind Lochte and Old Time Hockey in the $150,000 Tampa Bay (GIII) on Jan. 24. In his previous start on Dec. 20, the Kentucky-bred son of Sky Mesa beat 12 rivals to win the $75,000 Tropical Park Derby. Overall, Sky Flight has won three of five starts and $120,455. BASHFORD MANOR – The field (from the rail out with jockeys and morning line odds) for Saturday’s 114th running of the $100,000 Bashford Manor (GIII) for 2-year-olds at six furlongs (Race 6 at 8:30 p.m. ET): He’s Comin in Hot (Jamie Theriot, 9-5); Patrick Rocks (Victor Carrasco, 10-1); Roman’s Chance (Miguel Mena, 20-1); Dothat Dance (James Graham, 20-1); Shoot Craps (Deshawn Parker, 2-1); Justanothermorgan (Aaron Court, 20-1); Sapphire Storm (Robby Albarado, 10-1); and Show Bound (Julien Leparoux, 5-2). DEBUTANTE – The field (from the rail out with jockeys and morning line odds) for Saturday’s 115th running of the $100,000 Debutante (Listed) for 2-year-old fillies at six furlongs (Race 7 at 9:05 p.m. ET): Langstars Charmer (Jareth Loveberry, 10-1); Adhara (Corey Lanerie, 2-1); Tia Chuy (Deshawn Parker, 20-1); Sheza Fine Justice (Cory Orm, 20-1); Cosmic Evolution(Calvin Borel, 5-1); Areolite (Julien Leparoux, 5-2); Thievery (Robby Albarado, 9-2); and Don’t Boss Me (Didiel Osorio, 6-1). FIRECRACKER – The field (from the rail out with jockeys and morning line odds) for Saturday’s 26th running of the $200,000 Firecracker (GII) for 3-year-olds and up at one mile on the Matt Winn Turf Course (Race 8 at 9:39 p.m. ET): Frac Daddy (Corey Lanerie, 5-2); Sky Flight (Julien Leparoux, 7-2); Skip By (Rafael Hernandez, 20-1); R. Great Adventure (Jamie Theriot, 15-1); Hammers Terror (Robby Albarado, 5-1); Knights Nation (Brian Hernandez Jr., 6-1); Departing (Miguel Mena, 3-1); Medal Count (James Graham, 15-1); and Skyring (Joe Rocco Jr., 15-1). KELLY’S LANDING – The field (from the rail out with jockeys and morning line odds) for Saturday’s sixth running of the $70,000-added Kelly’s Landing overnight stakes for 3-year-olds and up at seven furlongs (Race 9 at 10:11 p.m. ET): Good Lord (Miguel Mena, 15-1); Schivarelli (Corey Lanerie, 4-1); Souper Knight (Robby Albarado, 8-1); Stealcase (Rafael Hernandez, 8-1); Guns Loaded (Jon Court, 8-1); Ruble (Julien Leparoux, 5-1); Agent Di Nozzo (Joe Rocco Jr., 6-1); Russellin (Francisco Torres, 8-1); Brewing (James Graham, 12-1); Viva Majorca (Brian Hernandez Jr., 9-2); and Championofjustice (Jack Gilligan, 30-1). ALL-STAKES 50-CENT PICK 4 ON SATURDAY NIGHT – Churchill Downs Racetrack will offer a special all-stakes 50-cent Pick 4 on Races 6-9 Saturday, comprising the Grade III, $100,000 Bashford Manor (Race 6 at 8:30 p.m. ET); $100,000 Debutante (Race 7 at 9:05 p.m. ET); Grade II, $200,000 Firecracker (Race 8 at 9:39 p.m. ET); and $70,000-added Kelly’s Landing overnight stakes (Race 9 at 10:11 p.m. ET). The ultra-competitive sequence, which asks bettors to pick the winners in each race, features 36 runners. SATURDAY NIGHT’S ‘DOWNS AFTER DARK’ THEME IS ‘BOOTS, BREW & BBQ’ – The theme for Saturday night’s “Downs After Dark Presented by Stella Artois and Finlandia Vodka.” is “Boots, Brew & BBQ” in which guests are encouraged to break out their best cowboy and cowgirl duds to enjoy draft beer, specialty cocktails, BBQ food trucks, mechanical bull rides, “Bet or No Bet Presented by Thorntons” (Races 6-9) and live music by Nashville artist Justin Adams. Admission gates open Saturday at 5 p.m. ET and the first of 11 races is 6 p.m. ET with the season finale set for 11:10 p.m. ET. General admission for Saturday night’s Spring Meet finale under the lights is $10. Reserved seats can be purchased in advance online at www.ChurchillDowns.com. SATURDAY IS CLOSING NIGHT – Saturday is the final day of a memorable 38-day Spring Meet at Churchill Downs. Racing on the Kentucky circuit shifts to Ellis Park in Henderson, Ky. for a 31-day meet that begins Friday, July 3. Racing will be staged there every Friday, Saturday and Sunday at 1:50 p.m. ET through Labor Day, Monday, Sept. 7. Simulcast wagering at Churchill Downs will be offered on the second floor of the Clubhouse in the ITW area this Sunday from 11:30 a.m. until 8 p.m. ET and will move to The Parlay (located just inside the Gate 1 entrance) on Wednesday, July 1. Simulcast wagering will remain there through Labor Day. Free admission for simulcasting will be offered every Wednesday as well as Thursday, July 2; Thursday, July 9; and Monday, July 27. Popular summer signals Del Mar and Saratoga begin Thursday, July 16 and Friday, July 24, respectively. Live racing returns to Churchill Downs on Thursday, Sept. 10 for a 12-day September Meet every Thursday-Sunday for three weeks through Sunday, Sept. 27.